Food experiential designer Jen Monroe's color-themed parties are taking Brooklyn by storm. For much of her life, artist Jen Monroe thought she wanted to become a food writer. "I kept a food blog, cooked in restaurants, and tried to claw my way into food publications," explains the 25-year-old former English major. However, she quickly realized that the ways food was portrayed in the media was, well, boring. "The scope of ideas with which we're presented in regards to food are extremely narrow," she says. "I've always been interested in the darker aspects of food psychology -- like broken food systems and the inability to eat locally or organically because of the prohibitive expense -- and in ways to approach food as fantasy and as a transformative medium." Monroe went on to launch Bad Taste Blog, a digital kitchen where she could experiment with new ways of crafting and portraying edible arrangements. But eventually she realized she wanted to find another way to channel her passion for food. "I started feeling as if I was gonna die if I had to write one more cutesy story about what kind of chicken I had for dinner," she explains. "It had so little to do with my real life." It was after reading Joris-Karl Huysmans's 1884 novel À Rebours, the story of an eccentric aristocratic hermit who spends his fortune on elaborate "aesthetic endeavors" like a funeral for his lost virility featuring a banquet of entirely black food, that Monroe became inspired to launch her next culinary project. Enlisting the help of her sister, Caroline, the pair began throwing color-themed dinner parties inside their Brooklyn homes, eventually bringing this movable feast to The Schoolhouse, a DIY venue in Bushwick. "I tend to think of the color dinners that I do as somewhat absurd and far-removed from reality, and for me that kind of extremism is a commentary -- albeit a pleasurable one -- on alienation and on the ways in which culture has made us feel weird about food," she says. 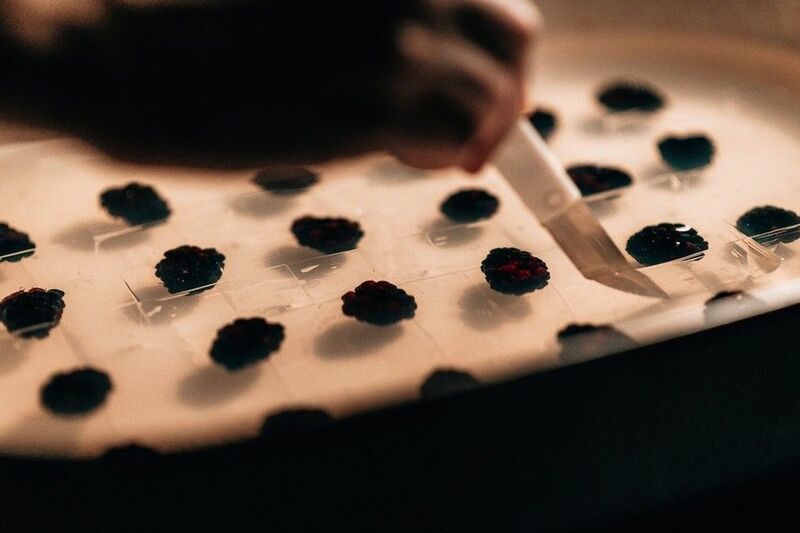 Monroe's events, which have slowly gained a local cult following, incorporate installations, performance pieces, projections, sound work and, of course, real food, which she cooks with the help of two sous-chefs. So far Monroe has held her own " Black Dinner," which featured delicacies like squid ink pelmeni with blackened chicken and garlic, blood sausage stuffed with black trumpets and beurre noir, and mussels steamed in stout with Russian black bread. The dinner was lit by candlelight as friends and fellow artists sang, performed spoken word, and enjoyed each other's company. 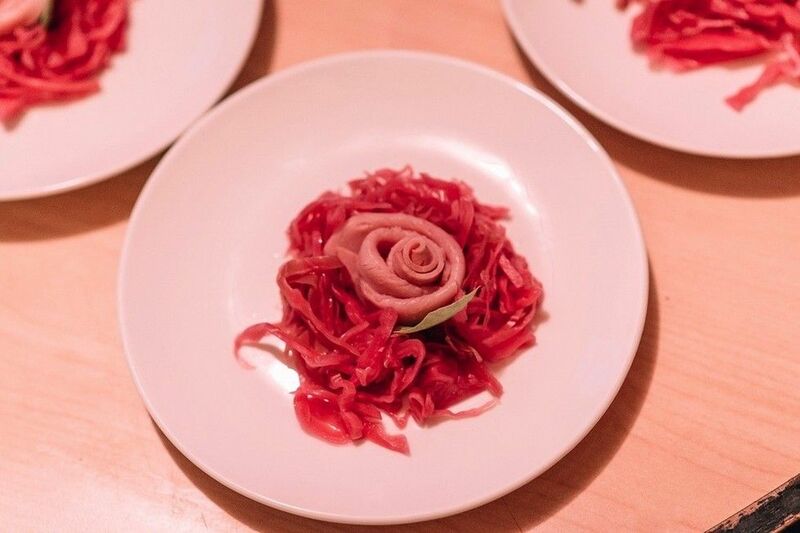 With the coming of warmer weather last spring, Monroe held a Japanese cherry blossom-themed Pink Dinner, where she served a house-made mochi, specialty Campari cocktails, and a palate cleanser of jellyfish, grapefruit and ginger. Most recently the pair produced "Yellow Meal," which brought out local artists, musicians, sculptors, writers, gallerists, directors and creatives of all kinds for a night of yellow-themed hors d'oeuvres and entrees. To maintain ambiance, Monroe often tries to cap attendance at a scant 20. Those able to get into Yellow Meal were treated to sunset-tinged flaming drinks, pillboxes loaded with edible yellow ephemera (like tamago, roe, saffron rice, daikon radish, lemon and finger lime), smoked fish ravioli, wild-mushroom squash compote and much more. She says she's quite deliberate in her color choices, as well as her menus. "Designing the menu is the most fun part -- though tracking down all the ingredients, not so much," she jokes. Starting with a list of all the foods she can think of, in whatever color she's working with, Monroe then lets her imagination take hold. "Different dishes just sort of pop out, or sometimes they get worked out backwards -- 'll come at it with a feeling that I want to evoke, texturally or visually, and then sort the ingredient elements out from there." 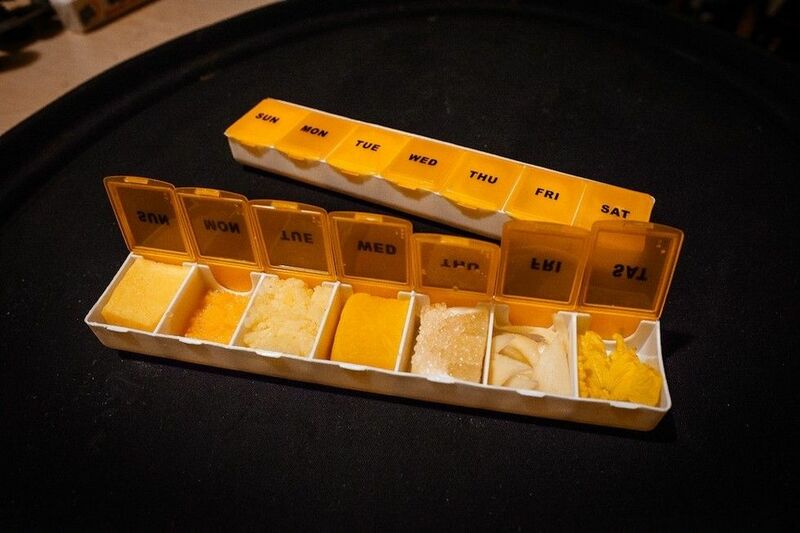 At Yellow Dinner, one of the courses was a riff on sushi, served in a day-of-the-week pill organizer. From left to right, the elements were tamago, roe, saffron rice, daikon radish, lemon and finger lime, homemade pickled ginger, and a flower. The colors are also largely dictated by the season -- Monroe tries to keep the menus organic -- and by the vibe of the weather, making "Yellow Meal" the perfect match for fall foliage and supermarkets stocked with golden squash. There was, however, a bittersweet melancholia in the air. "For me, [the meal] had a lot to do with death, though not all necessarily in a bad way. I was watching a lot of time-lapse videos of slime mold on YouTube [during planning], which are unbelievably beautiful, so a lot of that footage got projected onto a huge wall during the meal." 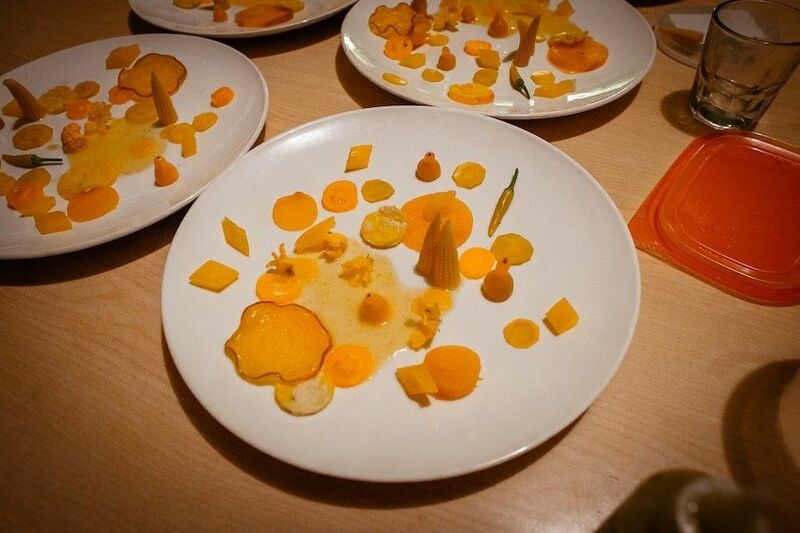 As artist Aaron Johnson shared at that recent dinner, "the project succeeds in elevating food into art. Sure there's plenty of foodie food and cuisine to be had... However, a painting, should it be art, should not merely decorate. Dance and film should not merely entertain. Food, should it be art, should not just be pure pleasure for the taste buds." In that vein, all three dinners have featured performances by multi-disciplinary artist Sarah Kinlaw, who uses movement, vocals, and spoken word to arrange performance pieces that are in direct dialogue with the color theme. At Black Meal, she dressed in head-to-toe black and sang vocal chants by the medieval mystic Hildegard von Bingen in front of a black background. "Sarah's a classically trained vocalist, so it was incredibly beautiful -- it looked as if the song was being sung by a disembodied pair of floating hands," says Monroe. For Pink Meal, Kinlaw did a tap dancing piece with a pink parasol while being blasted with neon pink light, and for Yellow Meal, she performed alongside another friend and multi-disciplinary artist, Becca Kauffman, who read a five part poem about the color yellow. 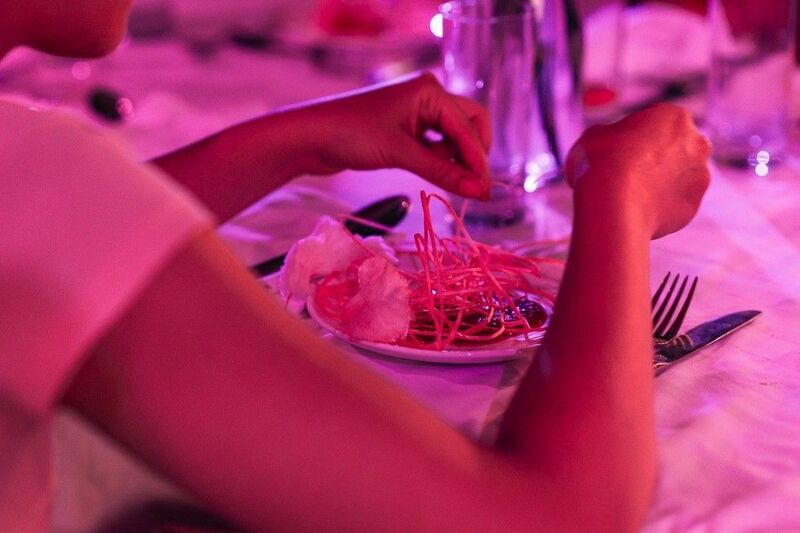 Both the Pink and Yellow Meals featured the minimalist neon light installations of artist Liu Buhua. 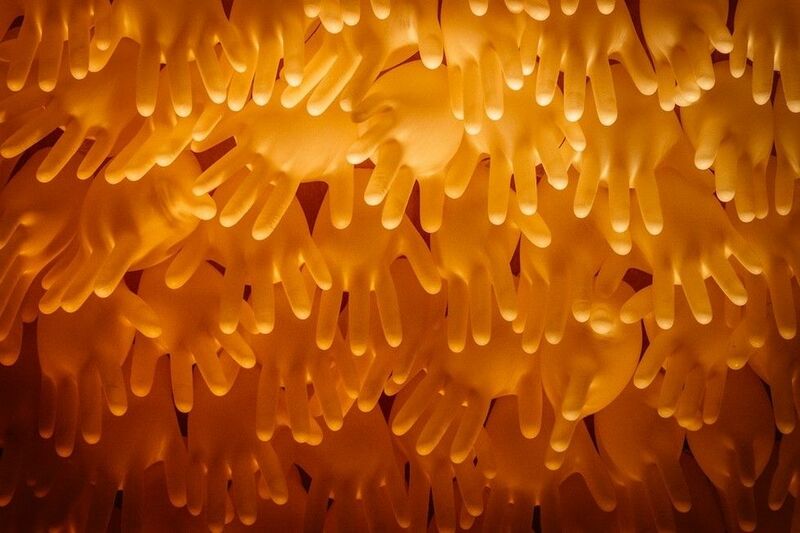 For one of our favorite art pieces in Yellow Meal, Monroe had her friends help her build a 4'x8' wall of inflated yellow latex gloves hands. A Yellow Meal salad course of carrot, roasted beets, omelet rings, baby yellow tomatoes, baby peppers, golden cauliflower, baby corn and cucumber blossoms with a keffir lime and palm sugar dressing. Currently Monroe is gearing up for her wintry "White Dinner," and while anyone can purchase tickets, she has generously offered one Paper reader a complementary seat at the table. To enter, go HERE and write "Paper" in your entry -- a lucky diner will be chosen at random. 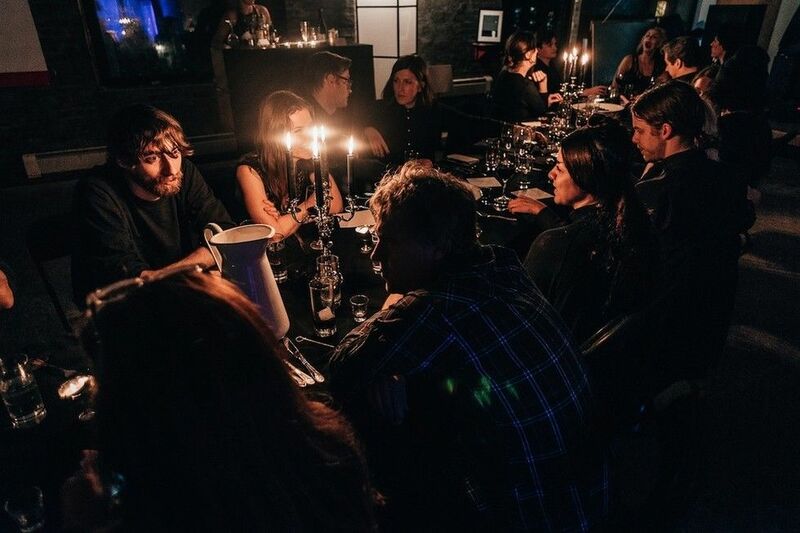 White Meal is scheduled for mid-January at a secret location, and the winner, as well as those hoping to purchase the tickets, will be notified via email. As for what's next? "I'm definitely open to doing dinners in other locations," says Monroe. "I'd love to put something on outside of the city, or even outdoors. I'm also really interested in doing gallery dinners." While these are just a few of the ideas Monroe has cooking in her prodigious brain, for now her feasts serve as gallery-worthy works of art in their own right.